‘Beyond the Streets’, an excitingly rambling show of diverse work by street artists housed in an LA warehouse, curated by graffiti historian Roger Gastman is currently open for the public through to 6th July at 1667 North Main Street. For those in Los Angeles, we do suggest a trip to the warehouse. For a long time, graffiti and street art were directly associated to negative social spheres, allegedly rubbing shoulders with vandalism, gang violence, and crime. But despite its tainted humble beginnings, Graffiti and Street art has earned its place at the contemporary art table, whereby works have now become a publicly appreciated form of art, we could even say that it has been monumentalized through the initiation of mural and publicly commissioned art projects. 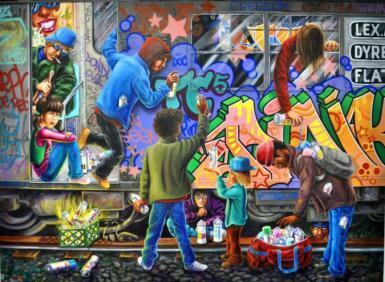 Gastman creates a diversified review on graffiti art through a massive showcase of 100 artists. He brings together established artists’ works in a variety of mediums that run adjacent to street art. This diversity created a kaleidoscopic visual experience for visitors, where traditional murals, stencils, and sculpture unexpectedly cohabitate on peculiar surfaces like chapels, stripper poles and even a temple. The immersive and stirring approach to the visiting experience hasn’t neglected the deeper educational and contextual connotations that reside within the warehouse’s walls, Gastman injected a true sensibility to learning and grasping the value and meaning of the works. Archival photographs throughout the warehouse’s walls are displayed to enrich the show with an intellectual and informative sensibility. The exhibition truly honored its title as it profoundly restudied its own concept, purpose and influence, paid homage to its forefathers and created a space for graffiti and street art to thrive for the generations to come.